The average USD Bitcoin price has dropped from 800-ish in December and January to around 650 this week, and previously tracked factors do not completely explain it. 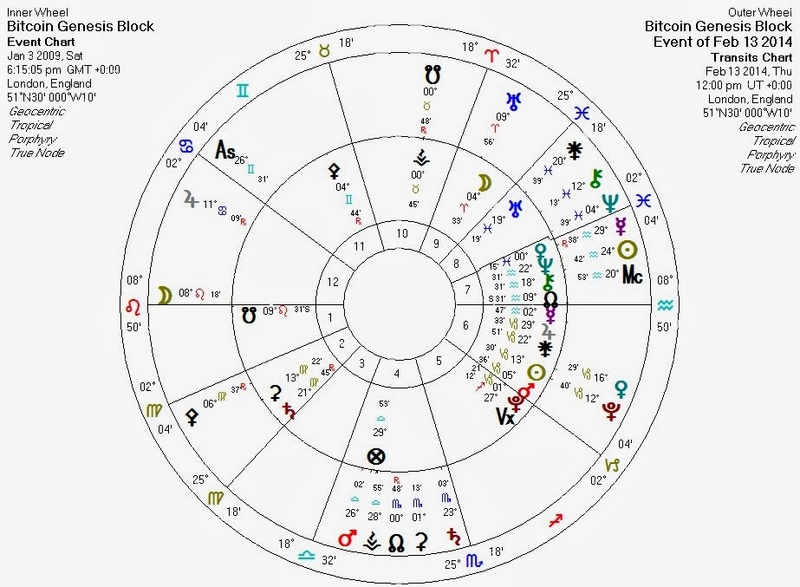 Certainly, we've had recent transits which could drop the price: transiting Sun conjunct Bitcoin Chiron, and the Mercury station triggering transiting Neptune (last month we proposed all aspects to transiting Neptune as a negative factor), perhaps even the peak of Neptune semisextile the Bitcoin Moon. But if these factors were it, we should have seen some rebound by now. Instead, we're at a relative new low today. Recent news certainly gives plenty non-astrological reason for the drop: MtGox problems with withdrawals, Charlie Shrem's arrest, and Russia's government declaring Bitcoin unwelcome. None of these problems seem fatal. I see two transits peaking today. One is the transiting Moon conjunct Bitcoin's South Node: one might expect a price drop, albeit one only lasting a few hours. The second is a slower transit, and a bit more mysterious: the transiting South Node conjunct Bitcoin's Vesta. There isn't a lot written about Vesta (much in the way there was not much about Pallas until very recently), but there are tidbits that give us clues. Astrologers that pay any attention to Vesta at all sometimes associate her with investments. These include SF-local and always-solid business astrologer Georgia Stathis. "Wolf of Wall Street" Jordan Belfort incidentally has Vesta conjunct Sun. Today's transit chart and sagging BTC price give us reason to keep an eye on Vesta in the future, particularly if the price recovers a bit after today. Pluto, meanwhile, is nearing its exact conjunction with the Bitcoin Sun in late March, stationing in April, and then hitting the Sun again at April's end. I expect some very big Bitcoin news in that period. February 13, 2014 at 4:55 PM Silk Road 2 hacked, all BTC lost: http://www.deepdotweb.com/2014/02/13/silk-road-2-hacked-bitcoins-stolen-unknown-amount/ Again, bad news, but not fatal to the Bitcoin protocol itself or to the ability of the public to use it.